Ports: Miami, USA - St. Johns, Antigua and Barbuda - Basseterre, St Kitts & Nevis - Road Town, British Virgin Islands - Pointe−a−Pitre, Guadeloupe - Philipsburg, St. Maarten - Miami, USA. I’m cruising as a solo. 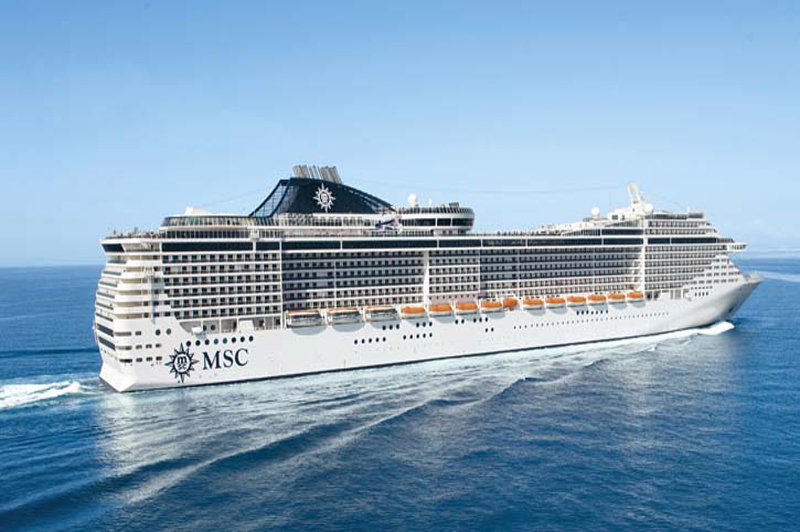 This is my 3rd cruise on the MSC Divina, my 9th MSC cruise and my 139th cruise overall. I do have some good cruise friends sailing. I am flying into port on the day of embarkation so travel begins very early. I left the ranch at 3:45 am for the drive to Waco, TX and the 4:50 am boarding time for the flight to DFW. I arrived about 4:40 am and was through the TSA screening and at gate one at exactly 4:50 am. Soon we were off to DFW airport where I arrived in time for my 7:10 am flight to Fort Lauderdale. 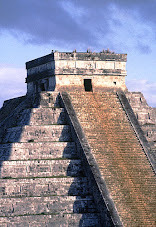 The flight was uneventful arriving about 11:00 am local time. I arranged transport through SAS transport to the Port of Miami arriving about noon. I went through security and had a short line to see an agent and receive my MSC Black Loyalty Club member sail card. Unfortunately they had not begun boarding as there was a delay in debarkation of previous cruise due to fewer Border Agents because of the government shutdown. We did begin boarding about 1:00 pm. They did allow the Black Card guests to board just after the Yacht Club. I met two long time cruise friends and we went to the buffet on deck 14 for a nice lunch after boarding. I had Tacos from the Mexican station and the Guacamole was wonderful. After lunch, about 2:30, I went down to my cabin on deck 5 for a much needed nap. Having an interior cabin this cruise has an advantage as it is very dark and great for day time napping, I did not wake until they began announcements for the safety muster. Safety drill was uneventful, they scan your card at the muster station and demonstrate the life jackets. When I returned to the cabin my luggage was there…always good to see as I had everything in one bag this trip. I met my friends at the Divina Bar about 6:30 pm for cocktails then we went to dinner in the Black Crab Dining room (MDR) on deck six. Our other friends and clients sailing were there so it was very nice to see everyone. We have a very nice eight-top table with a nice padded tablecloth (pun on Carnival) and proper silver service and good waiters. For dinner I ordered the Tomato Soup, Classic Niçoise Salad and the beef Short Rib entree. For dessert a Snickers Cake (yes it tasted like the candy bar) and Catalan Cream. All but the soup was very good as was the service. After dinner I retired to the cabin for needed rest after a very long and busy day. It's nice to be aboard the MSC Divina. Smooth seas overnight with just enough movement for a very enjoyable nights sleep. The bed is ideal and very comfortable. I have four nice pillows, so very adequate. I awoke about 7:40 am and knowing friends were meeting at 8:00 and the fact my cabin is on same deck as the MDR I was able to meet them for a proper breakfast. I ordered Eggs Benedict with a side of bacon & fresh grilled potatoes. I was served Hot Milk that is not always easy to get on other cruise lines but very common on the Divina. After breakfast I unpacked and finished cabin set-up converting 220 plugs to 110 and a charging station for my laptop and iPhone, put up magnets, and stored luggage for the duration of the cruise. I upgraded my internet account and began this review as well as some internet work. I’m disappointed that there are so few TV stations available and no regular American networks, but that’s really to be expected on an international ship. I went out to atrium and ran into friends so my computer work turned into a Bloody Mary gathering time. I did get an excursion changed so all would be on same time frame. We met a great bar server that really took care of us and it was fun on our Atrium day. This is the Captain’s Night so we were back in the Divina Bar for our complementary cocktails before the feature show. The 7:00 pm show in the Pantheon Theater was The Show Must Go On a tribute to the rock group Queen and featuring the Dancers, Feature singers, the Opera singers, and Aerialist. A new show to me and very worthwhile. The Captain and senior staff were introduced before the show…a new thing is that they now allow drinks in the theater…a no no previously. After the show a quick stop at the cabin (convenient location to theater) then to the MDR for dinner. It was a very nice Captains dinner, I ordered a Shrimp Cocktail, Eggplant Parmesan, Lobster Ravioli (as starter), the Beef Tournedos entree, and Key Lime Pie & Rice Pudding for dessert. The entree was excellent but service was slow. After dinner I enjoyed listening to Classical Interludes in the Atrium that featured a wonderful French Torch Singer who did some of my favorite tunes. I retired afterward and turned our clocks forward one hour. It was a great day on the MSC Divina. Smooth seas overnight and I again slept very well. I awoke at 9:15 am so overslept the MDR meet time for breakfast. About 10:15 I went up to deck 14 and the buffet. They have a wide variety of choices for breakfast. I had various types of eggs and bacon with a hot waffle. I then had some cabin time to review options for today and future excursions. I again ran into my friends in the atrium so we were able to coordinate that we were on the same excursions since MSC had made some time changes on many including the ones we were taking. A few Bloody Marys & a Prosecco from Jay our new favorite Divina cocktail server…then time for some Pizza and beer on deck 14. MSC is well know for the quality of their pizzas. Our waiter from the recent MSC Seaside cruise was working and we visited, he prefers the Divina over Seaside and has been on her six years. A nice plate of chocolate covered strawberries and a bottle of Prosecco was delivered to the cabin this afternoon as a part of the Black Card benefits. I went to Un Pacio all’Opera Classical Concert at 3:15 in the Pantheon Theater, it was a very nice show and something only found on MSC cruises. It was then time to prepare for the evening beginning with the Black Card member reception at 5:15 in the Black & White lounge. The reception was nice, they served cocktails and more. They even delivered a round of Hugo’s to our table. The Captain and staff did a toast and one of the feature entertainers performed. Soon it was then time for the 7:00 pm show in the Pantheon Theater, tonight it is The Amazing Mask. I had seen this show twice previously and it was a most impressive production with singing, dancing, acrobatics, and more. I had a great view from row two center for this spectacular show. I love my cabin location as I can pop in after the theater shows before heading to the MDR for dinner. Dinner was again good, I ordered: Juniper & Gin cured Gravlax, Kolokithokrftedes (Zucchini fritters), Penne Pasta with Vodka, and for my entree the Cocoa-dusted Pork Tenderloin with bliss potato & grilled asperagus. For dessert Galaktoboureko (Greek custard pie). All good and Tenderloin very good. Service was slow again tonight, it was quite busy previous night but not tonight so not good. I retired after dinner to cabin. It was another busy and fun day at sea on the MSC Divina. Very smooth seas again overnight and I was up very early by 5:00 am so caught up on blog and internet time. The MDR opened at 7:00 am on this port day and I went shortly afterward and was seated at a share table straightaway. I ordered three eggs with ham, bacon, & hash browns and a fruit plate. It was very good as well as my hot milk. We docked about 9:00 am and at 9:45 met my excursion Catamaran Cruise & Lobster Lunch, the same tour I did when here previously on the MSC Seaside. We walked off the ship at exactly the meet time and walked the short distance to the Mystic Cats. Not overly crowded and it was a nice sail around to the west side of the island. The water is beautiful and the scenery is spectacular. We could see the mysterious island of Montserrat and even Nevis in the distance. We stopped at Turner’s Beach for an hour+ then re boarded the Cat for our Lobster Lunch. It was fine and the bar was free flowing for the rest of the cruise. We then sailed to a secluded beach for another hour of beach time before sailing back to St. John’s and the ship. Easy to get to my cabin on deck five from gangway on deck four…I like it. I took an immediate nap and slept until 7:15 pm missing tonights Frank Sinatra tribute show in the theater. It was a good rest though. I made it to dinner @ 8:30 in the MDR, I don’t always do dinner on excursion days but the nap helped. It was Caribbean night and the menu was weakest of the cruise. I ordered Shrimp Tails Guadeloupe-style, Virgin Island Salad, Creamy Creole Pasta (as starter), and the Jamaican Style Beef entree. For dessert the Red Velvet Cake. Dinner was just OK actually, but our service continues to be slow, I had hoped it would improve with fewer guests dining, but no it didn’t. I had cabin time and updated blog after dinner but retired soon as I have another excursion tomorrow. It was a nice first port and first excursion day. Again very calm seas overnight and I slept well…I again woke very early at 5:00 am but I had 8 hours counting my late nap yesterday. I went to the MDR for a nice breakfast this morning with eggs, bacon, ham, potatoes, hot milk, and more. My excursion met and left at 8:45 this morning, I’m doing a Catamaran Snorkel and Nevis beach tour. A larger group with some familiar faces, but a very nice ship. I was able to stake out a nice seated spot with a table too. We sailed to about 40 minutes and anchored off a cliff area and ship wreak for our snorkel spot. I snorkeled to the wreak seeing a great sea turtle and various nice fish…it was much better than I expected it to be. Once back on board they served a Caribbean lunch: Slaw, Rice & peas, Jerked Chicken, Hot Dogs, and drinks. Not as good as the Lobster yesterday but more filling perhaps. We then set sail to Nevis for a beach break. I was considering the half hour tour to Hot Springs and Alexander Hamilton’s birthplace, but ended up taking the short walk to Sunshines. This is a well known beach bar to Rag sailors, Charters, and Yacht-ees. I did have their signature drink the ‘Killer Bee’ it was different and very good (hit link for recipe). 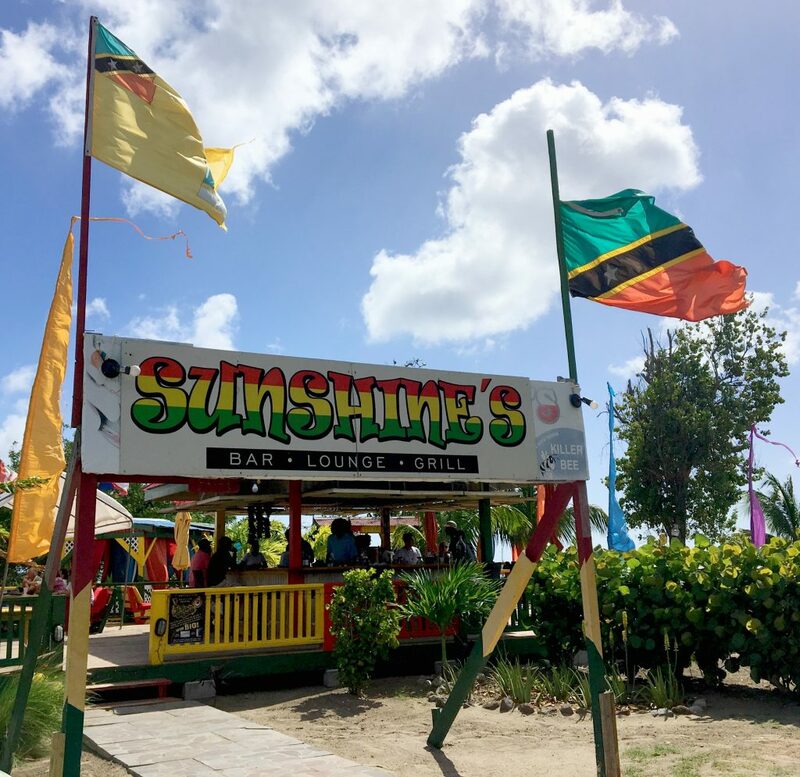 Soon our Cat started the one hour return sail to Basseterre with complementary drinks, music and dancing arriving about 3:30 pm. It was a nice sail, better than previous day IMHO. I was in the cabin and began process of cleaning sand from shoes, etc. and again decided to take a nap. Just as yesterday I slept until past 7:00 pm. The show tonight was a small Opera adaptation of Verdi’s La Traviata with the feature opera soloists and Divina dancers. I did make it to cocktails and then the Black Crab restaurant. Dinner service was again very slow in fact I finally was able to bring it to the attention of the Matre’D and he witnessed the first appetizers arriving at 9:22 or 52 minutes after sitting at the table. That being said it was a very good dinner, I ordered: the Moules Mariniers (mussels), Asian Salad, Rigatoni Meatballs (as starter), the Roast Pork Loin entree, and Schwarzwaelder KirschTorte (Black Forest gateau) & Crêpes Suzette for dessert. The Rigatoni Meatballs and desserts were excellent. After dinner I listened to the Torch Singer in the Atrium until retiring to the cabin. It was a very interesting, tiring, and fun day on the Catamaran excursion. Again very smooth seas overnight and I slept very well. I was up early enough to eat in the MDR when it opened at 7:00 am for another great breakfast. I returned to the cabin and relaxed as I have no excursion today. There are nice beaches here but this is really a great jumping off point for visiting some of the smaller islands in the BVI…including Jost VanDyke and the famous Soggy Dollar Bar or the famous Baths natural formations. I’m doing none of those today to relaxation is the plan. I did get off the ship long enough for my cabin attendant to clean but returned in time for a nice buffet lunch in the Calumet & Manitou restaurants. A wide variety of choices today too. I then had cabin time, booking some travel, and updating blog. I did a walk about this afternoon then to the Divina Bar for cocktails. I had drinks with my French friends who had been on my past two excursions…nice surprise…and Jay my favorite bar server speaks french. At 7:00 pm I went to the production show: The Witches of Paris in the Pantheon Theater and sat in my seat on row three. It’s actually about the 7th time I have seen it including it’s predecessor show based on magic. Very high energy show including the Divina Singers, Dancers, Aerialists, Acrobats, and more. All leading to a finale of the Can-Can and all acts together on stage. A really good show. Again a quick stop at the cabin on the way to dinner in the Black Crab MDR. Either the Maitre’D fixed the service problem as requested or my friend in Geneva who reads my blog assisted, but the service issue set right. We had our appetizer 16 minutes after ordering and all of three of my starters within the time we received our first last night (52 minute). Also the ice, bread, tea, & water were on the table when we sat. Thank you MSC as the situation was effecting the overall cruise experience. Dinner was also very good, I ordered: Pork Liver Pate ‘Strasbourg’, Porcini Mushroom Ragout (vol-au-vent), Shrimp Fettuccini Alfredo (as starter), and the Costeletas de Porcoa Salsicheiro (Grilled Pork Chop) entree. For dessert I had the Peanut Butter Pie and warm Apple Strudel. All was very good and the service excellent. I gained thirty minutes of life as I was out of the MDR by 10:00 pm. Time for cocktail and music. It is 1980’s night and many guests are dressed for it as well as entertainment team. Lively bars tonight and as alway unique entertainment each evening in the Black & White lounge. It was a nice restful day on the MSC Divina. Smooth seas continued and another relaxing night. I slept very well until after 8:00 am and then went to MDR before it closed at 9:00 am. I have gotten into the habit of a good MDR breakfasts. Sat with two ladies from Switzerland and a couple from Ireland. After a nice breakfast I visited Guest Services and had some cabin time and relax before an afternoon hike. I went to the Calumet & Manitou buffet at noon and had a nice selection of various international dishes…it’s like a world tour of food eating on MSC. My tour, Scenic Drive and walk to Carbet Waterfalls met at 1:15 in the Pantheon Theater. My friends are also on this excursion. We had a very full bus and were off through Pointe-a-Pitre to the western island of Basse-Terre and the Parc national de la Guadeloupe. Once we entered the park and began the interesting drive on the narrow winding road up the slopes of the volcano La Soufriere we were in a tropical rainforest. Once we reached the fall reception area it was a short walk to see the lower falls, but a 30+ minute walk to the main upper falls viewpoint. Lots of steps up and down but a fairly nice stone pathway all the way. The view is amazing. I love waterfalls and have seen many and these are best I have seen on a tropical island (including Hawaii). I had promised myself after doing the long waterfall hike in El Yunque in San Juan several years ago never again, yet I just did it again. This is it though! We returned to the bus for the drive back arriving at the ship just before the 5:30 departure time. My legs and knees were really sore but I made it to the Production Show at 7:00 pm. This is Italian night and the show was a cabaret of various popular Italian songs and tunes. It was a great show and the Italian guests really loved it. The Black Crab MDR was really full for our Italian Night dinner but our table service was once again excellent, I discovered that it was the Restaurant Manager that saved us from our previous bad service problem. Thank you very much…dining is such an important part of the cruise experience. I ordered very Italian tonight: Arancini Sicilian-Style, Lasagna Bolognese, Risotto Mari a Monte, the Chicken Brest Parmigiana entree, and for dessert: Lemon Delight and a Kiwi Sorbet. Very Good dinner. I even had a evening cocktail while listening to music in the Atrium. I hobbled back to the cabin, took Advil-PM, and retired for a much needed rest. It was a great day on the MSC Divina. Smooth seas overnight and I slept very well, I’m sure the Advil-PM helped and I feel good considering all the walking yesterday. I slept past MDR dining time so it was up to the Calumet & Manitou buffet for breakfast about 9:40 am. I found the fresh omelet station and had a very nice Western omelet with bacon, potatoes and hot milk. It was very good. It’s a clear and sunny day and most are off the ship although a lot are staying on board especially for an MSC cruise. I visited frinds on deck then cabin time to update this blog and rest the legs. A walk about on outside decks and I have a very nice buffet lunch. A bit about the lunch buffet: Pizza is always good on MSC with a very large pizza station and ovens at entry so it’s easy to eat on deck or inside. You can watch prepare the pizzas and toss the dough. About four or more staff working it at busy times…no waiting for Pizza. They have a carving station with nice meat selections…large salad area, large fruit station, large bread area, an ethic area, as well as all the international selections. I met friends on deck 15 outside bar for sail away, the MSC Magnifica was also docked and they did departure horn blasts to each other, it was nice. So were the Pina Coladas. Time for the short production show Voices featuring the singers and dances. It was a good show and they ended it with Con te partirò with the three feature singers and two opera singers…it was brilliant. I love my cabin location, just below the theater so easy to refresh before dinner. Dinner and service was very good. Mediterranean Theme tonight, I ordered: Beetroot Carpaccio, Iceberg Salad, Seafood Linguine (as pasta starter), Roast Corvina (fish) as an entree. For dessert a Banoffe Pie (banana) and Pistachio ice creme. It is the big White party on pool deck tonight and most were wearing white this evening. Guests having a great time. I retired to the cabin for some reading and rest. It was another great Day on the MSC Divina. Smooth seas continue and I slept very well overnight. I went to the MDR about 9:00 am for a very nice breakfast and had another interesting table of guests. Service has been great each morning in the MDR. 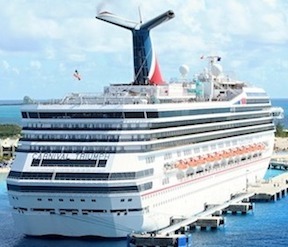 It has been a very nice cruise…one reason is only 76 children on board this cruise, there were over 700 last cruise. It can become a problem due to the ChildrenSailFree promotions. Although there are not as many scooters for seniors on MSC there can be too many prams. 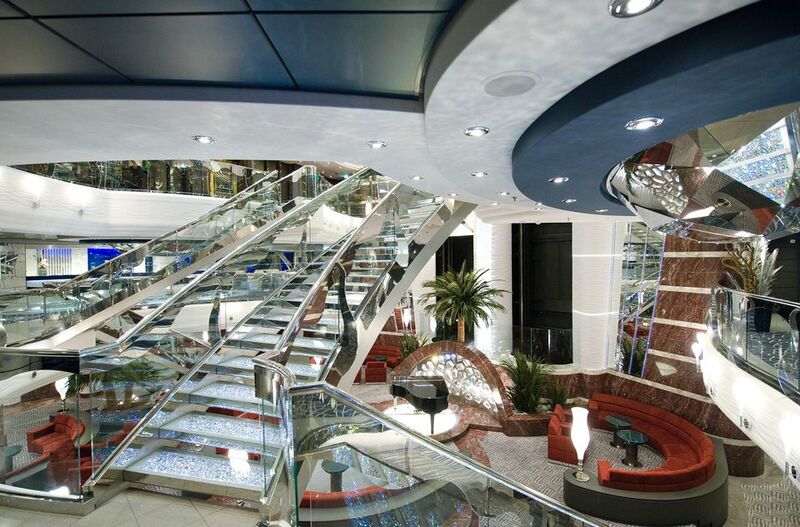 Also 500 fewer guests this cruise than last…makes a difference especially in the buffet area. So I am very lucky on the cruise date selection. I did some online work this morning then went to the Atrium about noon where I saw friends and we ended up drinking our complementary bottle of Champagne and visiting for a while. Thanks Adrian a great bar server at Divina Bar for opening the bottle and providing glasses. Cabin/Nap time followed and BTW (by the way) the TV has not been turned on since day one, kind of nice. At 6:00 pm I went up to the Black & White Lounge for the Loyalty Club party, they offered Prosecco or Rum punch and some hor’dorves. Similar to the Black Card party but they had a photographer taking photos with the Captain and I did that since they offer a complementary photo to Black Card guests. I met friends next door in the premium Restaurant Eataly at 7:00 pm. Dinner here was good, I ordered: Alla Carbonara, La Tagliata (beef sirloin), and La Zuppa Inglese Golosi di Salute (English Trifle). Dinner was very good and a nice presentation with the steak cut into squares and best mashed potatoes of the cruise. This is a Loyalty Club benefit so meal, wine, and water included, just left a cash tip. Thanks you MSC. My body said go to bed since I usually do after late dinner seating, but it was only 9:00 pm eating a bit earlier. 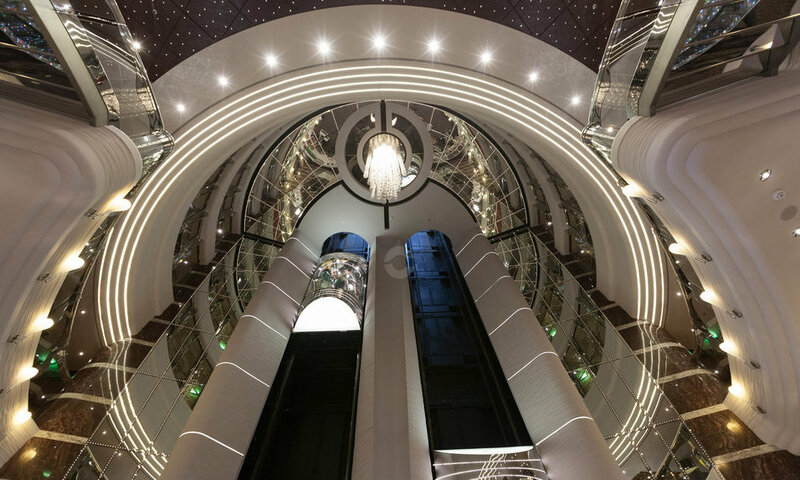 Lots of activities including a tribute to Tina Turner production show, the beautiful lounges on deck seven playing live music, various shops open, and more. 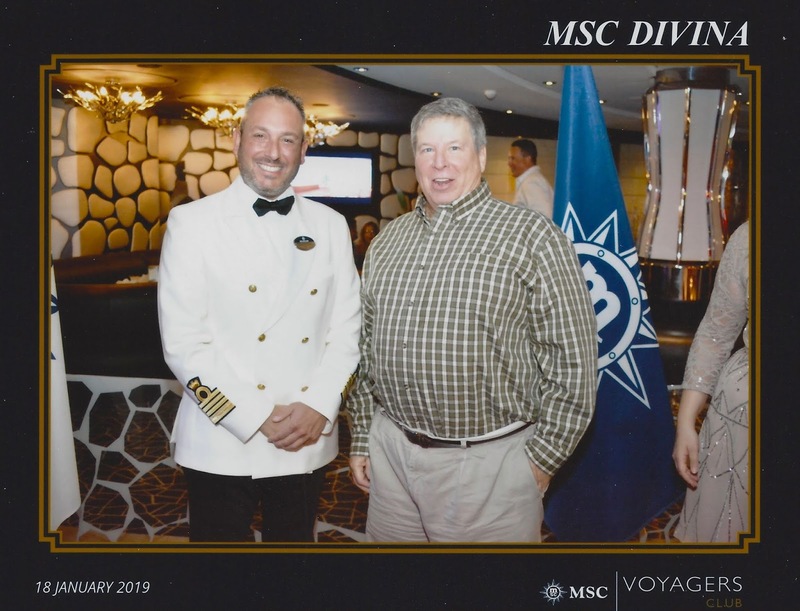 It was a slower but fun day on the MSC Divina...thanks again for dinner MSC. Again smooth seas overnight and another good nights sleep. I woke about 7:00 am and got on the internet early to check mail and messages before the wifi begins slowing down once everyone logs-in today. Since I was around early I went to the MDR again for breakfast. It was very good…I ordered my usual fruit bowl and eggs to order with a side of bacon, ham, and hash browns. Then picked up a photo from the photo area...very busy on last day...but my photo was only taken the previous night...then back to cabin to do some Travel Agent work. Before lunch I walked about the pool decks and they were absolutely packed with people on this last sea day…a lot of speedos in this European crowd too. I had a couple more hours of cabin time before cocktails about 5:00ish in the Divina Bar then moved to the Garden Bar on deck 14 to watch the sunset. The production show was Treasure Island and it was very good. It included the MSC Divina singers, MSC Divina dancers, the Acrobats, the Aerialists (two types), the Strong men, and even some Magic. A big production show much like a circus with music. Following the shoe was a farewell finale with entire cast an also MSC Divina crew. And of course the entertainment staff’s traditional farewell message. A very entertaining evening. Dinner was good. I ordered: the Creme of Curried Pumpkin Soup, Pasta and Tomato Basil, and the Cordon Bleu entree, for dessert: Tarte Tatin (confit apple) and Creme de Clafoutis aux Cerises (baked custard w/cherries). After dinner I returned to the cabin to pack my bag. It was a very nice final sea day on the MSC Divina. We arrived very early in Miami and I am doing the self debark program. It was to begin at 7:00 am but it did not…the U.S.C.G. delayed clearing the ship thus delayed ship debark. The Border and Customs guys were doing a great job. The result was some initial backup but once we were cleared it progressed fine. I was through customs by 8:15 am and purchased the MSC airport shuttle and was on bus by 8:30 a.m . Very short wait to fill bus and at airport by 9:15 am. A bit of a wait to check bags, then to go through TSA but maybe an hour total. I was eating Street Tacos by 10:10 am in Terminal D. at MIA. Flight to DFW boards at 1:15 pm. and arrived at 3:45 local time. Flight to Waco @ 5:00 and home at the ranch by 6:45 pm. Long but fairly easy ravel day. I have cabin 5039 a port side forward interior located on deck 5, not a full guest cabin deck as it the Atrium deck (mid ship) and the MDR-Black Crab Restaurant located aft. The cabin is just one deck below theater and one deck above the port gangway. A great location. It is well decorated and somewhat spacious cabin for an interior. It has a push button safe, twin/king beds, large mirrowed headboard, two night stands with lights, a small refrigerator, small table, large upholstered chair, seat at dresser/desk, and TV with interactive features. There is a very large four door wardrobe with a set of drawers a set of shelves and large hanging area with two doors. Our MDR waiters were not efficient and very slow in beginning but really turned it around by mid-cruise as they knew we were unhappy. My cabin steward was wonderful. Overall the crew is more friendly than past MSC cruises, there were some exceptions, but it’s a very different environment from most cruise lines. Most cocktail servers provided very good service. Entertainment is the strong suit of MSC with very elaborate production shows and live music in most all venues. In addition to the production shows they have a ‘fun’ event scheduled every night night at 10:30 pm in the Black & White Lounge (large venue/lounge located deck 7 far aft). The MDR dinners are good to very good, Buffet food is good to excellent. The Calumet and Manatou Buffets were great as mentioned, but always very busy as they have no real alternate choices (as a Deli or Burgers joint). The pizza station, taco station, and salad bar were excellent. Eataly was much improved from my previous visit there. The MSC Divina has some very beautiful lounges and bars with live entertainment, I tried to visit most. Black Card — I received a dinner in a specialty restaurant, a Chocolate ship, two private Cocktail Parties, Champagne & Chocolate strawberries, a logo gift of a pen, photgraph, and more. Good program. MSC is very different than the usual American cruise lines and if your looking for the same experience it will be much different. You may like the differences or you may be unhappy with the differences. As an experienced cruiser I love different. If you don’t like change or are not flexible you will probably NOT like sailing a European cruise line. I like MSC and the Divina very much. Beautiful Public Rooms, Top quality MSC Production Shows & Entertainment, Quality and Beautiful Themed Bars, Large Cabins, Hot Milk readily available on buffet and MDR, Attentive bar servers, Good MDR Breakfasts, Smoothest sailing ever. They are really working on better customer support.